Well, in the next 24hrs we're going to find out just how much an "affiliation" is worth. With Colorado being eliminated from the NHL playoffs (and with their season over) one could logically assume that they might send a player or two to Lake Erie. If they do, I would think that Lake Erie will respond and send a player or two down to Fort Wayne. (But that's using "logic" and the more we're exposed to anything touched by the NHL, logic seems to be lonely stepchild). I haven't thought it through, but I'm not aware of any "major league" that ends before its minor leagues as the world of the NHL-AHL is doing right now. Spoke to one of the "powers that be" between periods, and he emphatically stated (twice in fact) that Krug was "cut". Even when asking about the reports that he was place on the IR, he still exclaimed he was "cut". We know that Beaupre will not be one sent as he has a shoulder injury. Now without Leach and Krug, the Komets will need help or face going in with just six defensemen. On another note: I was a little surprised that Embach won four awards...and very surprised that Will won none. At the very least he should have shared the "unsung hero" award with Nagle. Maybe even shared rookie of the year with Faille. I would hate to think where the Komets would be without him. I was extremely pleased for Perlini. The Av's sent down three players today. If I looked at the standings correctly, LE could be eliminated if they loose today (which they are up by one right now in the second). After reviewing stats of other 3 possible players we could get..do not know if I want any of them. So here is the story on Krug. The Komets did release him but when he went through his exit physical he failed it. 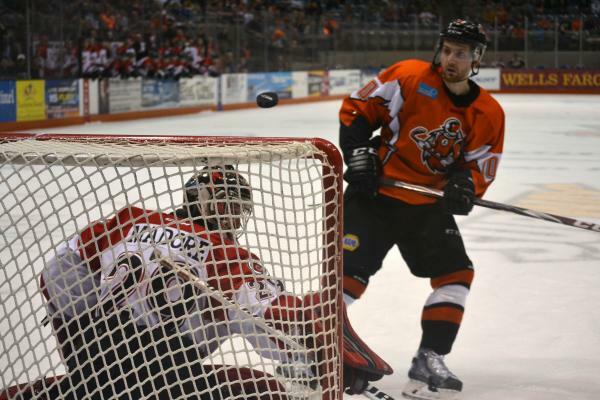 The Komets had to then put him on 21 day IR ending his season. Not sure, Who. Just was relaying the conversation as it ocurred. I guess my main point was how emphatic he was regarding being cut vs. put on IR. Actually my first concern was Krug's health (hoping that whatever led to him failing the physical was going to be able to be treated medically and not something that might threaten his career). This conversation took place between periods with lots of people close by. But he was very emphatic about it. Now I'm not trying to deny that he wasn't put on IR. It just makes me believe that there is much more to the story. But it doesn't change anything, either way. The K's are a work in progress again. Something that shouldn't happen at the end of the year as the timing couldn't be worse.